- Paul Boesch Retirement Show (August '87) = Demolition (Ax & Smash) lost, via DQ, to Tito Santana & Mil Mascaras. - WWF Survivor Series '87 (November 26) = Demolition, the Hart Foundation, the Islanders, the Bolsheviks, and the New Dream Team lost a "Tag Team Elimination" Match to Strike Force, the Killer Bees, Young Stallions, the British Bulldogs, & the Rougeau Brothers. 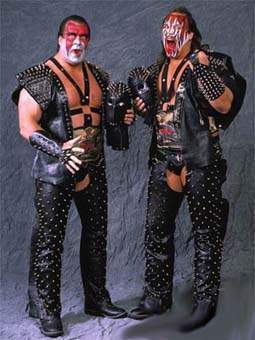 - WWF Wrestlemania IV (March 27, '88) = Demolition won the WWF Tag-Team Titles from Strike Force. - WWF Saturday Night's Main Event #16 (April 22, '88) = Demolition won, via DQ, over the British Bulldogs, retaining the WWF Tag Belts. 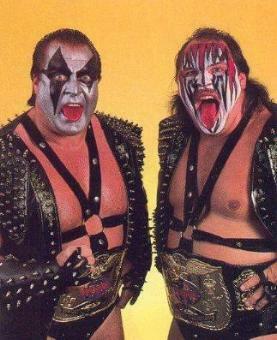 - WWF Summerslam '88 (August 29) = Demolition stayed the WWF Tag Champs, beating the Hart Foundation. - WWF Saturday Night's Main Event #17 (October 25, '88) = Demolition again defended the WWF Tag Belts, beating the Hart Foundation. - WWF Survivor Series '88 (November 24) = Demolition, the Brainbusters, the Conquistadors, the Fabulous Rougeau Brothers, and the Bolsheviks lost a "Tag-Team Elimination" Match to the Hart Foundation, the British Bulldogs, the Powers of Pain, the Rockers, and the Young Stallions. - WWF Royal Rumble '89 (January 15) = Demolition competed in the Rumble, which was won by Big John Studd. - WWF Wrestlemania V (April 2, '89) = Demolition retained the WWF Tag Titles, winning a "Handicap" Match over the Powers of Pain & Mr. Fuji. - WWF Saturday Night's Main Event #21 (April 25, '89) = Demolition lost, via DQ, to the Brain Busters, but stayed the WWF Tag Champs. - WWF Saturday Night's Main Event #22 (July 18, '89) = Demolition lost the WWF Tag Titles to the Brain Busters in a "3 Falls" Match. - WWF Summerslam '89 (August 28) = Demolition, with "Hacksaw" Jim Duggan, beat Andre the Giant and the Twin Towers. - WWF Survivor Series '89 (November 23) = Demolition, Hulk Hogan, & Jake "The Snake" Roberts won an "Elimination" Match over Ted DiBiase, Zeus, & the Powers of Pain. - WWF Royal Rumble '90 (January 21) = Demolition competed in the Rumble, which was won by Hulk Hogan. - WWF Wrestlemania VI (April 1, '90) = Demolition defeated the Colossal Connection to win the WWF Tag Titles for the third time. - WWF Saturday Night's Main Event #27 (July 16, '90) = Demolition (Crush & Smash) beat the Rockers to retain the WWF Tag Belts. - WWF Summerslam '90 (August 27) = Demolition (Crush & Smash) lost the WWF Tag-Team Titles in "3 Falls" to the Hart Foundation. 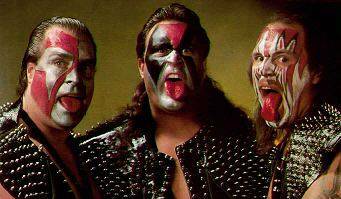 - WWF Saturday Night's Main Event #28 (September 18, '90) = Demolition (Ax, Crush, & Smash) were beaten by the Ultimate Warrior & the Legion of Doom. 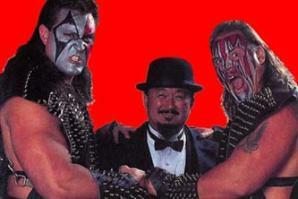 - WWF Survivor Series '90 (November 22) = Demolition (Ax, Crush, & Smash) & Mr. Perfect lost an "Elimination" Match to the Ultimate Warrior, "The Texas Tornado" Kerry von Erich, & the Legion of Doom. - WWF Royal Rumble '91 (January 19) = Demolition (Crush & Smash) competed in the Rumble, which was won by Hulk Hogan. - SWS Wrestlefest (March '91) Demolition (Crush & Smash) defeated Shunji Takano & Shinichi Nakano. - WWF Wrestlemania VII (March 24, '91) = Demolition (Crush & Smash) lost to Koji Kitao and Genichiro Tenryu. - WWC (Puerto Rico) 18th Anniversary Show (July '91) = Demolition (Crush & Smash) lost to Giant Warrior & TNT.